You would think that means "Mama," as in the one who gave you life. But no. It actually is Finn trying desperately to say "Tom." 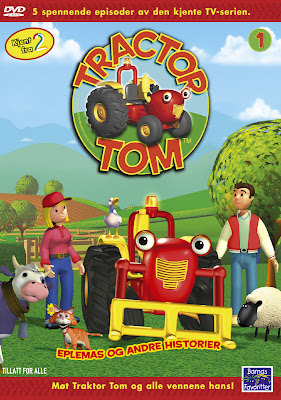 We have a DVD player that plays Danish DVDs, and Finn is entirely obsessed with a new DVD, and it's Traktor Tom. Finn requests this movie over and over and over and over and over and over..... Not that we always let him watch it, but it is great that he is absorbing Danish (that's what we tell ourselves, at least). So tonight Finn comes in the bedroom with the movie, saying "MOM! MOM! MOM!" Wes says to Finn, "Tom. With a T. Why can't you just say Tom?" (This has been going on for days—it took me one entire day to figure out he was even saying "Tom.") I said, "Does he ever say anything with a T sound??" Pause to think... "Not on purpose," Wes points out. We had a good chuckle over that. Then Finn ran off to get a "Gookoo," which is Finn for cookie (Lightening McQueen shaped graham crackers, to be more precise). Oh, and remember when I said we changed Baby Girl's name officially? Well Finn can say it. I have to get it on video, because it sounds something like, "Blah Blah." No matter how many times we repeat the new name, he still comes out with "Blah Blah." Sometimes he even says, "Baby Blah Blah!" Have you seen arrested development where the lawyers name was Bob Lablah? It sounds like like blah, blah, blah when they say it and the lawyer is played by Scott Baio...it's SO Funny!